Are you looking for the guide that helps you to install TWRP Recovery on your Mi A2 device? Yes? Then, You arrived at the right destination. I am going to tell you the exact method that will help you to install TWRP Recovery on your device in less than 20 minutes. I know you’re super excited to install the Recovery on your phone. But before that, you should follow each step that is given below. I recommend you not to skip any step because that will lead to damage. So before getting started to the guide, let us we know the specifications of Xiaomi Mi A2. Xiaomi Mi A2 has 5.99 Inch IPS LCD display which is protected by Corning Gorilla Glass v5. The Mi A2 device currently runs on Android 8.1 (oreo) operating system and equipped with Qualcomm Snapdragon 660 chipset. Talking about the storage, The Mi A2 comes with 32GB of internal storage and no expandable memory. Also, The Mi A2 device has two different variants, one is 6GB, and another one is a 4GB variant. Moving to the camera part, The rear has dual camera lens 12MP+20MP, and the Front camera comes with 20MP selfie shooter which is good while taking longer shots. The device has 3010mAh of battery capacity. So before we get started to the guide, you should need to follow some pre-requisites that are given below. Your device should have at least 80% of battery storage to avoid an accidental shutdown. Your device should have the bootloader unlocked. Download ADB fastboot drivers from here to your computer. 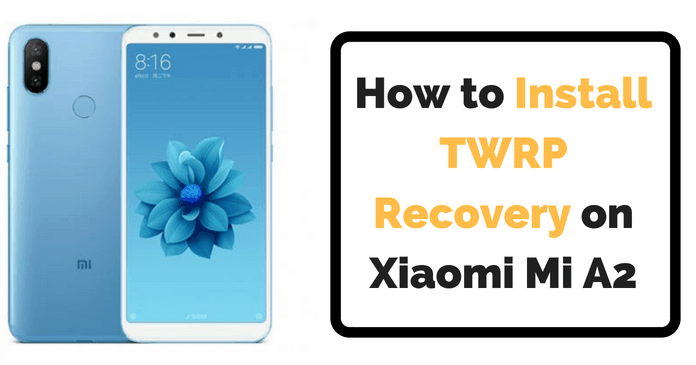 Here, I am going to give you the step-by-step instruction so that you can be easily able to install TWRP Recovery on your xiaomi device. Step 1: – First of all, Make sure that you have unlocked the bootloader of your device. Step 2: – Then, Unzip the downloaded TWRP Recovery image into some folder on your pc. Step 3: – Now, open the downloaded ADB tools folder and copy-paste the unzipped TWRP Recovery image files in it. Step 4: – Now, Unlock your phone and Go to Settings >> Developer options >> Enable OEM unlocking option. If you didn’t find Developer options menu on your device then, Again go to Settings >> About phone >> Tap on build number 7 times and you’re good to go. 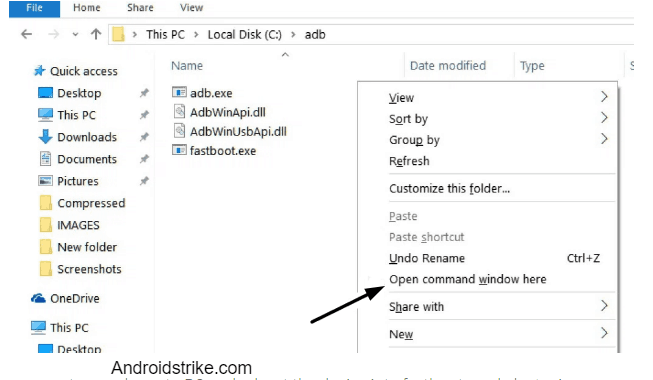 Step 5: – Now, Connect your device to the PC via USB and open the ADB tools folder and Press Shift Key + Right Click and then select Command Prompt from there. Step 6: – Open the command prompt execute the following code. Step 7: – The device will boot into fastboot/bootloader mode after that execute the following code. Step 8: – Now, Rename your TWRP Recovery image into recovery.img and make sure you have moved this file into the ADB folder. Also, Execute the following command to flash the TWRP image. Step 9; – Now, The system has flash TWRP Recovery, So now you have to reboot your device by executing the following command in the Command prompt. Step 10: – Now you’re done. Enjoy installing custom ROM’s and mods on your device. To boot your device into TWRP Recovery now. Turn OFF your device and Turn it ON by pressing Power Key + Volume Down key simultaneously for 5 seconds. I hope this guide helped you to install TWRP Recovery on Xiaomi Mi A2. If you have any doubts, please drop your questions in the comment section below. Also, Do share this article with your friends. Keep visiting the site for more tutorials.